In numerous entries of this blog there are halo simulations made with "a simulation software by Jukka Ruoskanen". The software has been under development for the past couple of years and has now reached the point where it is ready enough to be published. The software, HaloPoint 2.0, has its own webpage from which the software as well as it's user manual can be downloaded. The software package is a zip-file. Simply extract it into a suitable directory and keep the two components of the software, HaloPoint.exe and Simulation.dll, always in same directory. The software runs in computers having Windows operating system (tested in XP and Vista). Also a .NET Framework 1.1 is required, which is already installed in most computers, but in case it is missing it can be downloaded for free from Microsoft pages. In software homepage there are simulation examples together with parameter files so that getting started with the software is easy. In addition to the examples it is advisable to take a glance at the user manual so that the various features of HaloPoint 2.0 can be utilized. Hope you'll have fun with it. Thank you Jukka for your marvelous program! Thats good news ! I especially like the raypath visualization feature ! Really useful when explainig the halo theory. Jukka, this is a milestone in halo simulation. Thanks so much for the GREAT job! Jukka, that's a huge gift to all halo enthusiasts. It's one thing to write a simulation program, it's quite another to make the thing easily accessible, as you have done. Congratulations and thanks Jukka. You've made a great asset indeed for the halo community. Jarmo, Walt and Les helped tremendously in some details I was struggling with, so thank you for your valuable assistance. And Marko (Riikonen) was my main victim; he was convicted for three years to be my main software tester. And he pulled it off remarkably. His raw work as a tester and his vision really made a difference. Also Ágnes, Jari and Marko M helped in testing phase. Without the help of my friend Sami Weissmann the coding would have been a much rougher ride. So thanks goes to all of you involved in the process. Jukka, many many thanks for this wonderful software. It's a treasure. It works wonderfully, and is so easy to use! Does this work like les cowleys halosim? Another question: Can you do divergent light halos? HaloPoint algorithm is most likely very close to those of Les' and Walt's. The main steps of the simulation procedure are explained e.g. in Walt's book (Atmospheric Halos, Appendix F (pp. 132-133)) and Les has also a description in his site (How HaloSim works). 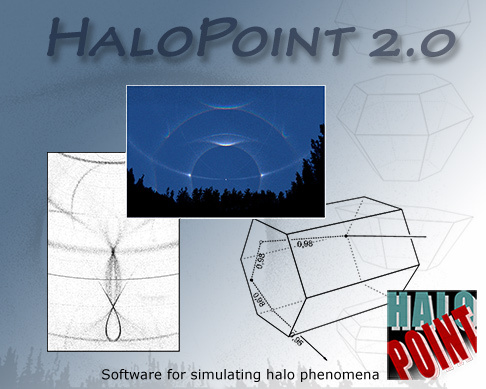 HaloPoint is essentially a parallel light simulation software suitable for Sun and Moon halos. We've used it to simulate some of our lamp displays also, but in these cases the simulations are only approximations. When one uses a torch light with quite narrow beam and places it, say, 100 meters away, the parallel light simulations is justifiable. But not the real thing. Thanks, Jukka !! Works with Windows 7 also. Great software, great web page and great manual. Good to this on-line after all these years. It is really handy to maruse. I'm gonna download it I just hope one day someone successfully does a divergent light halosim program that works like halosim 3 and like the halo point 2.0 Jukka I am definitely going to download this. I need a reliable Halo source code to make an adaptation for a special purpose simulation (non comercial). HalopOint2 is back online. The links in the post have been updated.